If favors could have Great-Grandmothers, at Fashioncraft we’d say that a lace doily would probably be these favors’ proud ancestor. 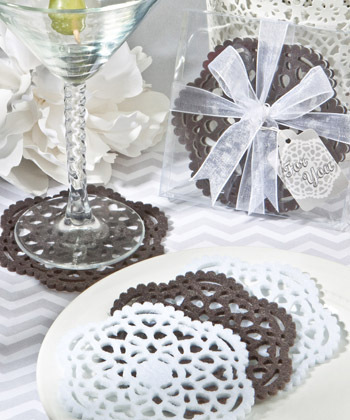 Each has inherited all of the pretty crochet-inspired details in its cutout, scallop-edged design and they’re sure to save your guests’ tables from countless water stains. But these coasters also have a durable felt construction and loads of modern appeal. We think that the favor relatives would be proud!